The Worm. Any time a pet has intestinal parasites, also known as worms, there is absolutely a chance for the children in the home to contract them too. “My Dog Has Ticks and Fleas.” Keeping your pets free from fleas and ticks will lessen the risk of your child being bitten. This is especially true since tick borne diseases in humans are on the rise. Shots Fired. Each year Alamance County has rabies cases. Keep your pet safe by making sure rabies vaccinations are up to date, and you’ll be keeping your kids safe, too! Sit. Stay. Heel. You want your dog to always be on her best behavior, especially around your other little ones. Obedience training can help your dogs obey, but can help your children’s behavior, too! 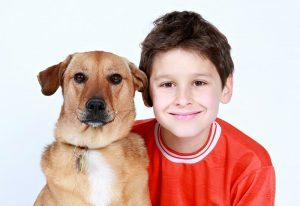 Children participating in dog obedience classes gain skills necessary to properly communicate with their pet, strengthens the human/animal bond and may even keep them from danger. When it comes to dog bites, children ages 5 to 9 are at greatest risk. The majority of documented dog bites occur from dogs familiar with the child. Rubber Ducky. Regular baths and grooming keep your kids from getting scratched by untrimmed nails during a cuddle or play session. Brushing helps to remove the dead skin cells and dander that can aggravate allergies. A pet that is matted doesn’t like to be touched. Brush and Floss. Scientists have identified 400 types of oral bacteria in dog’s mouths and 200 in cat’s. Our skin and immune systems normally stand between us and our pet’s germs- but those systems can be breached with a single bite or scrape of a tooth. As many as 10-15% of bites will become infected. Dental cleanings and teeth brushing can help reduce the bacteria present in your pet’s mouth. Back to school time is a time for families to reset and get back into a routine. Don’t leave out your pet. Administer those preventatives, schedule a check up, and take care of your pet and your kids at the same time!